KUPREANOF STRAIT — The captain of an Alaskan fishing boat is giving glory to God for giving him the fortitude to jump into the cold waters of the Kupreanof Strait to save one of his crewmen after their vessel capsized. “After losing my twin brother to the sea, it was not going to happen again,” wrote Christian Trosvig on social media on Tuesday. According to reports, on Monday afternoon, Trosvig and his three-man crew were fishing for salmon in the waters off Kodiak when their boat, called the Grayling, began holding water for unknown reasons and slowly started sinking by the stern. Crews aboard two other boats noticed that the ship was in trouble and sought to help, but as one of the vessels, the Calista Marie, tried towing the Grayling to shore, the boat capsized with all crew members aboard. The Coast Guard was also contacted. While Trosvig and two of his men were rescued from the frigid waters by a skiff and the Calista Marie, the fourth could not be located. After approximately 20 minutes, the crew member appeared bobbing in the waters and Trosvig jumped back into the tumultuous straight, swimming approximately 50 yards to rescue him. The heroic effort was captured on camera by the Coast Guard, which was hovering over the scene in a helicopter. “That fisherman didn’t hesitate. 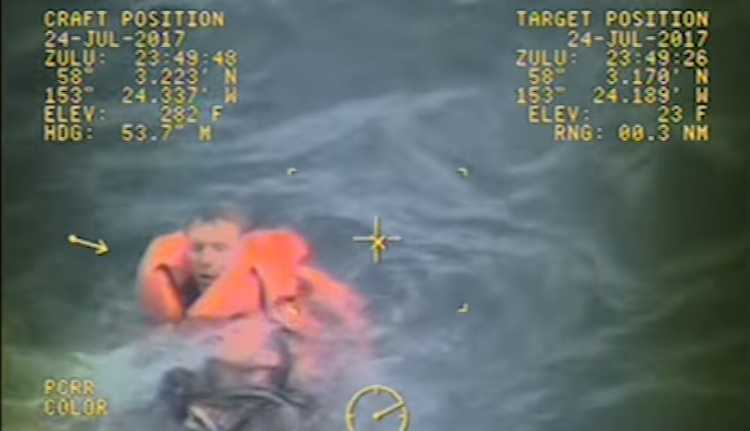 It was incredible to see him jump into 47-degree water to save his crew,” Lt. Kevin Riley, an Air Station Kodiak Jayhawk pilot, recalled in a press release. “Five foot swell, you had a seiner skiff bouncing around, you had a capsized boat with nets and rigging in the water floating around and as you can see in the video the individual that jumped in for the rescue was between the seiner skiff and the capsized hull at one point pretty close,” he outlined. Trosvig was able to latch onto his crew member, who was not wearing a lifejacket, and helped him to safety. The crew member was treated for hypothermia and aspiration of diesel fuel. While Trosvig is being applauded for his deeds, the captain says that it was God who gave him the bravery to dive into the waters and rescue his fellow fisherman. “To God be the glory for giving me the courage and strength to get my man out of the water and bring him back to life,” he wrote on Tuesday.